A generous donor teams up with Tufts to support research and teaching through the Professorship Partnership Challenge. For three decades, trustee emerita and Board of Advisors chair for the School of Medicine, JoAnn Giffuni Wellner, J63, has been deeply engaged with Tufts. Now she’s extending her impact with a flexible $1.5 million gift that the school can use to either endow a full professorship for a senior faculty member or create the school’s first two endowed junior professorships. If this plan is approved by the trustees, the dean can use the gift at his discretion. The Kenneth and JoAnn G. Wellner Professorship is the school’s first response to the Tufts’ Professorship Partnership Challenge and will be matched by $1 million from the university. The challenge is one of the top priorities of Brighter World: The Campaign for Tufts, and Wellner is a member of the medical school’s campaign committee. Wellner’s deep engagement with Tufts, born out of her meaningful undergraduate experience, has continued for decades. She joined the university libraries’ Board of Overseers in 1988, which she chaired from 1997 to 2000, founded and chaired the Friends of Tufts Libraries, and served on the Board of Advisors for the School of Arts and Sciences from 1998 to 2014. “JoAnn is one of the most engaged and effective champions of Tufts I have ever met,” said Sol Gittleman, former provost and the Alice and Nathan Gantcher University Professor emeritus. 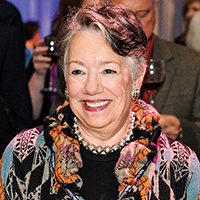 “It is not an accident that her involvement with all the Tufts libraries coincided with the extraordinary growth on all campuses of this essential resource.” She was also a Tufts University Trustee from 1989 to 2000, and joined the Board of Advisors for the School of Medicine in 2012, becoming chair this year. After earning degrees in both government and education at Tufts, Wellner graduated from Fordham University’s School of Law in 1966. She began her career at Manufacturers Hanover Trust Company, and in 1972, joined TIAA-CREF as a staff attorney, rising to an executive officer and vice president of external affairs. In 1988, she joined her family’s New York-based real estate management business; today Wellner is principal of Merit Operating Corporation. Wellner is just as dedicated to her considerable charitable work as she is to Tufts. She is president for her family’s private foundations, the Joseph V. Giffuni Foundation and the JoAnn and Kenneth Wellner Foundation, and is director of the Flora Baldini Giffuni Foundation, named for her mother. She serves as treasurer and an honorary chair for the Pastel Society of America, the country’s oldest pastel society, founded by her mother. She is also a director of the Open Mind Legacy Project, supported by the Alfred P. Sloan Foundation. Gifts and pledges made to the Professorship Partnership Challenge before or on June 30, 2019, are eligible. For more information, contact Rebecca Scott, senior director of development and alumni relations at the medical school, at 617-636-2777 or rebecca.scott@tufts.edu.